Researchers at Notre Dame have effectively prevented the binding of peanut allergens with an antibody called immunoglobulin E (IgE) to suppress the allergic reaction to peanuts using a first-in-class design of allergen-specific inhibitors. 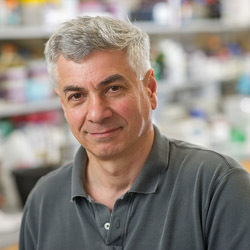 Shahriar Mobashery, the Navari Family Professor in Life Sciences in the Department of Chemistry and Biochemistry, has been awarded the 2019 Emil Thomas Kaiser Award from The Protein Society (TPS) for his research that applies chemistry to the study of proteins. Rebecca Whelan, associate professor of chemistry and biochemistry, is excited to be a new faculty member at Notre Dame, where she can now do research with the aid of graduate students and postdoctoral researchers. Growing up in South Bend and earning her degree from St Mary’s college, Katharine White never thought she would move back to the area. After all, White experienced the country from coast to coast from historic Boston to sunny California after her undergraduate career. Nevertheless, 12 years after earning her bachelor’s degree in chemistry, White now finds herself back as the Clare Booth Luce Assistant Professor of Chemistry and Biochemistry at Notre Dame. 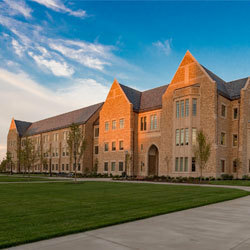 The Biophysics Instrumentation Core Facility is now open to researchers at the University of Notre Dame and external audiences, including those from other academic institutions and industry. Tianyuan (Abby) Cao, a fourth-year graduate student in the laboratory of Paul Bohn, Arthur J. Schmitt Professor of Chemistry, has been selected to receive a RISE Professional Scholarship from the Deutscher Akademischer Austrauschdienst (DAAD), funded by the German Federal Foreign Office. The RISE (Research Internships in Science and Engineering) Professional program provides research internships in Germany at companies and non-university research facilities to PhD students from the USA, Canada, Great Britain, and Ireland. Please join us at HCRI's 8th Annual Cancer Research Day! 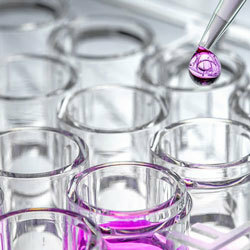 Research Day is an excellent opportunity to learn about cancer research being conducted in our community. This event includes a poster session, lectures, and a Keynote Address. 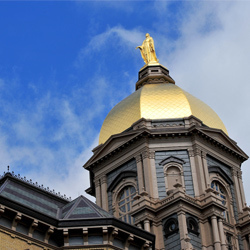 Twelve faculty members from the University of Notre Dame were recently awarded grants through the Notre Dame Research Faculty Research Support Program. 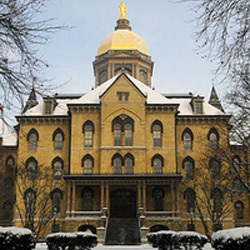 Sixteen faculty members from the University of Notre Dame have been awarded funding from the University’s Science of Wellness Initiative’s Catalyst Seed Grant program. Nearly 100 pre-proposals were submitted and faculty from five different colleges and schools received awards. Students are invited to compete and apply for a trip to the Galápagos Islands to trace steps that Charles Darwin took on his path to discovery. The week-long trip takes place August 3-9 and is open to Notre Dame undergraduates (rising juniors or rising seniors) in any field of study. Applications are due February 1. More than 80 graduate students and postdoctoral researchers gave either podium or poster presentations during the 2018 Colleges of Science and Engineering Joint Annual Meeting (COSE-JAM), held in early December in the Jordan Hall of Science galleria. Applications are now being accepted for the summer 2019 NDnano Undergraduate Research Fellowship (NURF) program. More than 20 projects in nanotechnology are available to choose from, and the program is open to current freshmen, sophomores, and juniors attending any college or university. Chemistry was a fine preoccupation for the Holy Cross priest whose research yielded numerous explosions and the smelly, oily marrow of synthetic rubber. But Julius Nieuwland’s first love was botany. 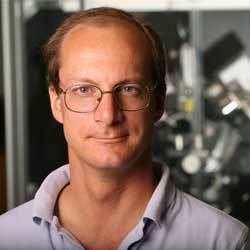 Peter Burns, Henry J. Massman professor, concurrent professor in the Department of Chemistry and Biochemistry, and director of the Center for Sustainable Energy and director of the Actinide Center of Excellence, was appointed as an Honorary Professor at Xi’an Jiaotong University in China. We are delighted to welcome Dr. Evgenii Kovrigin as the new Director of the Magnetic Resonance Research Center at Notre Dame. Predicting how mutations in proteins alter their ability to function is critical to understanding what drives health and disease in humans. A new study in Structure, Cell Press by scientists at the University of Notre Dame and their colleagues demonstrates how a minor mutation can have far-reaching effects on a protein, playing a role in the onset of different diseases. The body’s immune system is a valiant weapon against disease, and harnessing its power through a technique called immunotherapy is at the forefront of current research to treat cancer and other diseases. 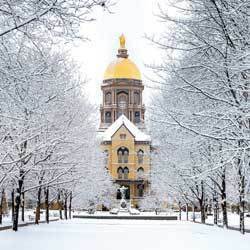 That’s why an unexpected finding by Notre Dame researchers and their collaborators, related to the way two distinctively different peptide antigens react with one T-cell receptor, tosses a new wrench into the process of building better molecules to develop immunotherapies.